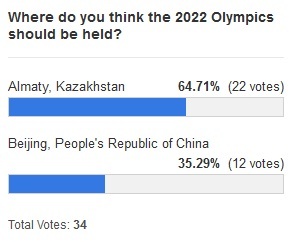 Alas, for those who voted for Kazakhstan, it was announced today that the 2022 Olympics will be held in Beijing – the first capital city in the world to hold both Summer and Winter Olympics. Somehow I’m not surprised and I’m not sure how to feel about it. I think I’ll wait and see what’s in store. What do you think of the IOC’s decision to put the Olympics in Beijing? I’d love to hear your opinions in the comments! I know I’ve been neglecting this blog but after the long season, I really needed to recharge, especially since my life has gone up and down furiously. There have been a lot of difficult times this year and I’ve been struggling to keep it together sometimes. Things are still up and down but I know I can manage somehow. For now, I’ll recharge and post once in a while until the season starts so I hope you can be patient with me. If you’ve been following me for a while, you’ll know that I’ll be more excited for one skater than the other but good skating is appreciated nonetheless. What are your thoughts on the return of Mao Asada and Patrick Chan? Let me know in the comments!